Financial Aid applications submitted BEFORE February 1st, 2019 can submit using 2017 tax returns. Financial Aid applications submitted AFTER February 1st, 2019 must be filled out using 2018 tax returns. 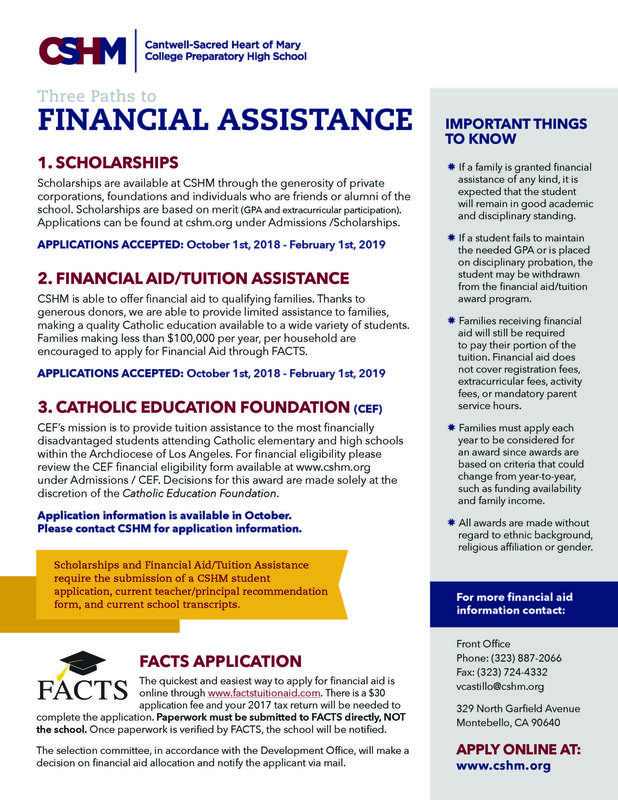 It is CSHM's recommendation that you complete your Financial Aid applications by February 28th 2019. Financial Aid funding reduces after this date. The amount of assistance awarded is based on need. Families receiving financial aid will still be required to pay a portion of the tuition plus the required fees (i.e. application fees, registration fees, books, mandatory fundraisers, parent service hours, athletic spirit pack fees, etc.). Step 1: Applications must be submitted through www.online.factsmgt.com/aid﻿. Please allow 3 weeks for your application to be processed by FACTS Grant & Aid. It is the family's responsibility to follow up with CSHM's Front Office to confirm the receipt of FACTS Financial Aid information. Financial Aid will be discontinued if tuition payments are not kept current. Aid may also be revoked in light of any serious disciplinary action, poor academic performance, chronic absenteeism and tardiness, or general non-compliance with school rules and expectations.